The Air Hogs brand has entered new territory here with what seem like just "regular" RC cars. Officially licensed for the Disney-Pixar animated movie "Cars 2," these 1/24th scale radio controlled cars look just like the stars of the movie, and come with all batteries included. They do have a special feature, though. When the front wheels turn for steering, the eyes turn too, like the car is looking in the direction it's going. 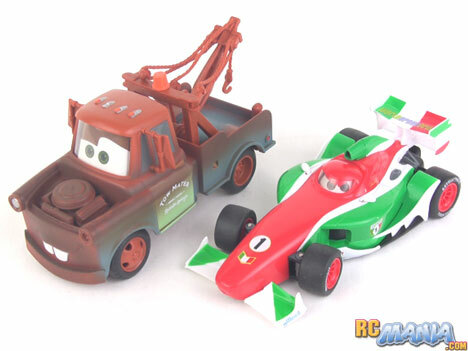 For a change of pace, I decided to test two vehicles at once this time -- Tow Mater and Francesco Bernoulli. Ok, right from the start I can confirm, these Air Hogs Cars 2 movie RC cars are fun. Lots of fun. Acceleration is immediate, speed is appropriate, and steering is responsive. They really look great driving around, too, and it'll be extraordinarily easy for a kid to slip into the imaginative world of racing just like in the movie. One interesting thing I noticed while driving these around was that they turn so quickly, it's difficult to actually spot the eyes turning, but you can expect a young driver's mind to fill in the blur, knowing how well the eye-turning feature works when you're looking up close & personal. The most interesting thing has to be the relative speeds of the two vehicles I drove. As you'll see in the video, in a direct race between Francesco Bernoulli and Tow Mater, Francesco has better initial acceleration off the line, but Tow Mater is actually faster and will quickly make the pass and never look back. That wasn't a setup that I did to cause the underdog to win. The Mater RC truck is actually faster. The reason? Bigger tires. All four vehicles in this series have the same motor and same transmission, but Mater's larger tires effectively give him a faster gear ratio. I didn't measure the other vehicles' tires, but it's something to watch out for -- ones with the smallest tires will be the slowest. The Air Hogs Disney-Pixar Cars 2 movie RC vehicles in 1/24th scale are a real riot. They look great whether sitting still or racing around, and the moving eyes feature is great fun. The use of safe design features helps them to withstand some abuse without small parts breaking, and the easy-to-use controllers make them accessible to even younger kids. The inclusion of a full set of batteries at a reasonable price just puts these over the edge. I only wish they had been made all exactly the same speed, and with tri-band radios so you could run any of them against each other (pay attention to the radio frequency when buying, so you don't get 2 on the same frequency like I did!). Other than those small things, I couldn't ask for more. Note: This review was not sponsored or sanctioned in any way by Spin Master, the Air Hogs brand, or any vendor. I evaluate all RCs from a completely unbiased perspective.